Been too heavy on the happy hours and now wishing you had a bathing suit-ready body for Labor Day weekend? You’ve still got time – and a boot camp class will surely get you fit fast. From outdoor sessions in Central Park to indoor workouts with fancy equipment, these five boot camp classes in NYC are the best to get slim. very cool! 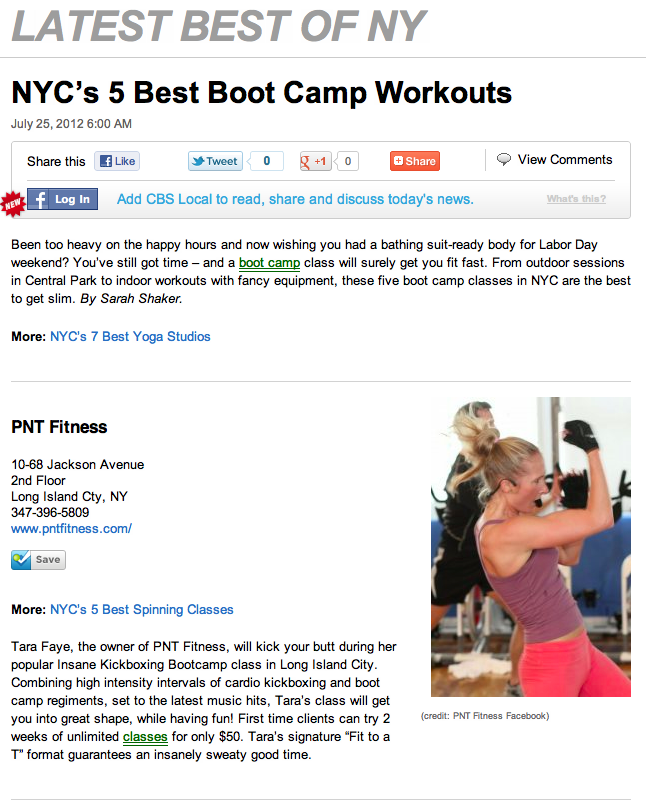 will you be writing any other fitness-type articles for CBS? i have a client who teaches kettlebells in nyc. Shara, would love to check out their class! Shoot me an email when you get a chance. I'll be pitching fitness, lifestyle, nightlife and restaurant articles with CBS each week. Being skiny is not fashion. It means health. Every person should pay a big attention to what eat and how much. Also, 30 minutes of motion is minimum that everybody shoud do daily. But we get too lazy, and found hard to do it.